This step-by-step tutorial shows you How to Install Google Play on Kindle Fire. We use an amazing little app called SuperTool (free, download link below) to install the Google Play Store on your Fire tablet. The tablet I used is an Amazon Fire 7 (5th Generation) tablet running Fire OS 5.1.4 (I also tested it successfully with firmware versions 5.1.2 and 5.1.3!). On a PC, go to http://RootJunkysdl.com in your browser. Then download SuperTool from the “Fire Tablet 5th Generation” folder. After the SuperTool download completes, extract the SuperTool (it’s a zip file) to a folder on your hard drive. We recommend to extract it into its own folder on the Desktop, or use “C:\temp\super” if your PC allows you to extract to that temporary folder. It doesn’t matter where you extract the files – as long as you extract them to somewhere you can find easily. Once the SuperTool is done extracting, use your PC’s file browser to find the extracted files. When you’ve found the extracted files, go into the “AmazonFire5thGenSuperTool” folder (screenshot below). In the AmazonFire5thGenSuperTool folder, run the “auto.bat” file. (If you just see “auto” and no “.bat”, run the “auto” file – it’s the same thing). The SuperTool will launch in a command prompt window (like DOS, if you know what that is). Use the SuperTool menu to first Install the ADB drivers onto your PC. 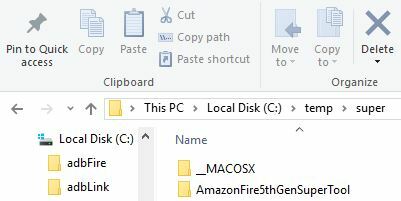 The purpose of this step is to allow your PC to access and talk to your Fire Tablet properly. This is one of the most important parts of the how to install Google Play on Kindle Fire tablet process. Without this step, your PC won’t properly see your Fire tablet. After the ADB drivers are installed, test the ADB drivers using the SuperTool menu. If the test is successful, continue with the next step. If it was unsuccessful, try to install Universal ADB Drivers (Google it) instead of the drivers included with the SuperTool. The drivers that came with SuperTool worked for me. Now make sure ADB Debugging and Apps From Unknown Sources are turned ON in your Fire Tablet. 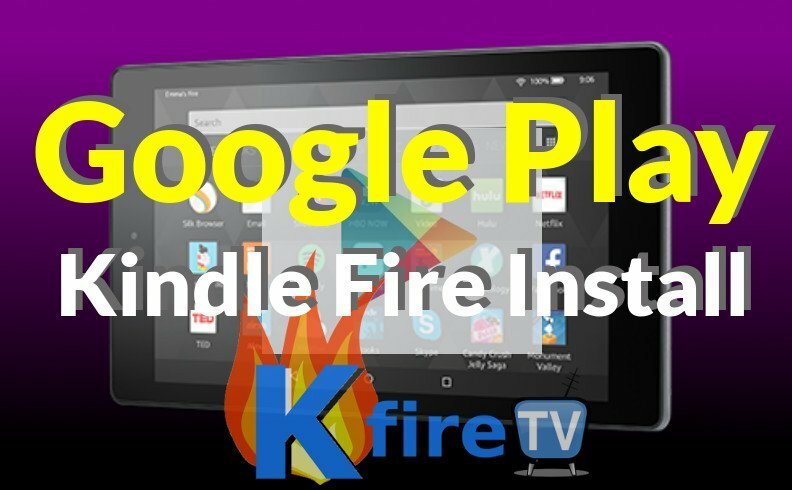 This step is absolutely vital in how to install Google play on Kindle Fire, since Play Store will only install on Fire Tablet if these are turned on. To enable ADB Debugging, go to Settings. Then go to Device Options. Now press on the “Serial Number” at least 7 times to unhide the “secret” Developer Options button. After the Developer Options button appears, press it. Then press “Enable ADB”. To Enable Apps from Unknown Sources, go to Settings, then Security. Then press “Apps from Unknown Sources”. After ADB Debugging and Apps From Unknown Sources are turned on, plug your Fire Tablet into your PC using a Micro USB cable (standard Android device cable – came with your Fire tablet). After you plug your Fire tablet into your PC, you should see a popup question on the Fire tablet screen that asks if you’d like to Allow or Deny. Press ALLOW to allow your PC to communicate with the Fire tablet via USB. Your PC should now display a notification that says “Fire device attached” or something similar. Use the SuperTool that launched in a command prompt window (in an earlier step) to Install Google Play Store on Kindle Fire. You can do this by selecting the option that says “Install Google Play Store” from the SuperTool main menu. After you select the SuperTool menu option to Install Google Play, follow the prompts in the SuperTool command window to complete the install process. Once Google Play Store is installed on Fire tablet, reboot the Fire tablet at least once to trigger Google’s app updates. If the Fire tablet doesn’t automatically ask you to sign in to your Google account after the Play Store is installed and you rebooted the tablet, then Sign in to Google by launching the Play Store. The Play Store won’t let you search for apps until you’ve signed in to a Google account. After you’re signed in to Google and you can use the Google Play Store on your Fire tablet, you can optionally replace the Fire launcher with a much better, more familiar launcher called Nova Launcher. This is very highly recommended. In addition, you can use HijackLauncher (free Android app) to make Nova Launcher the default Fire tablet launcher (no more Fire homescreen!). Until someone develops a way to root the new (Kindle) Fire tablets, this is the closest many people will get to unlock their Fire tablets. This method essentially gives you nearly-full access to your Android Fire tablet’s capabilities, without having to go through the difficult process to root Fire tablet (which I was unable to do with my new Fire tablet, by the way. Fastboot just wouldn’t work for me!). The Fire tablet (5th gen) is a great little Android tablet that we’re glad can be at least unlocked to a moderate degree using this Google Play Store install method. So we strongly recommend you unleash its potential by installing Google Play on this puppy. After that, replace the Fire launcher with Nova launcher, install Google apps, and optimize your Fire tablet with an application auto-kill app. Questions? Ask on the KFire YouTube channel. Special thanks to RootJunky for the awesome work!